How small does small get when it comes to sewing machines? Very small, I tell ya. You don’t need a giant industrial sewing machine to make a stitch. Maybe a portable one will do for you. But what if even those little beauties are too big for you? Fret not – there’s a wide array of handheld sewing machines too! Not everybody needs to sit at a table and sew for hours. Maybe you are not a professional sewist or even a sewing hobbyist. Maybe you just need to mend or repair something from time to time, and a common needle and thread produce too unstable and sloppy results. If that’s the case, it would be pointless to spend hundreds of bucks and occupy a significant part of your room with a machine that you will use once every three months. All you need from time to time is some very simple work on your favorite pieces of clothes that you don’t want to throw away just because a tiny seam decided to fall apart. You travel a lot and need a small sewing gadget that can fit in a compartment of your backpack and go anywhere with you. You ended up with a tear on your rear end last time you bent over to search the floor for a lost needle. The very needle that was supposed to help you fix the trousers. Searching for a needle in a haystack that is your carpet is frustrating enough. There’s gotta be a simpler and safer way of mending. You don’t have time or patience to learn how to operate a standard sewing machine. However simple some models might be, it still takes quite a lot of time to start feeling comfortable with them. If you don’t want to deal with all the bells and whistles, a handy handheld little device could be a solution to answer your needs. I wouldn’t be honest if I didn’t admit that I am not a huge fan of those. As an enthusiast, I consider sewing an art form. And to create art, one has to spend tons of time and effort at honing up their skills. So, to say that a handheld sewing machine can replace a standard one would be much the same like saying that a slice of takeout pizza can replace a proper, full-sized meal with a nice glass of wine at a fancy restaurant in Italy. Unless, of course, that slice is exactly what you need. Take a look of a few most common places where a handheld machine won’t do a great job. It won’t sew through many different fabrics or layers of fabric. Even some standard sewing machines won’t do it, so it would be too much to expect that from a device that can fit in your pocket. Don’t expect even, elegant, great looking stitches.This machine only relies on your hand – and all of us know that it’s impossible to have a hand that steady. Even though ease of use is one of their crucial selling points, some models do require a learning curve. If your mind is made up and you definitely want to buy a small sewing machine, make sure not to get one of those. Many users admit that these are not very durable. Most of the time, they are made from cheap plastics. That means you will have to be very cautious so it doesn’t break even while in your suitcase. If price is your main concern, note that there are handheld sewing machines that are really cheap. They are even cheaper than basic portable ones that produce far better results. So, here’s the answer to the question if a handheld sewing machine is worth getting or not: it depends on your needs and expectations. If you don’t need a complicated contraption with tons of options, opt for a handheld machine – they are cheap enough and will probably do your bidding. But if you plan on really learning how to sew, a standard machine would be a far better choice. Now that you know some basic pros and cons of the concept itself, let’s proceed with reviews of a few most popular ones I found on the market. This little gadget is meant to do quick repairs and temporary basting, so the manufacturer themselves made it clear that it wasn’t made for serious work. Hats off to them for honesty, since I really don’t like when someone tries to advertise a bat as a Batman. Another thing they disclose is that it works best on light fabrics. It should come threaded, so you can turn it on and practice right away. There is no power cord or adapter, so you will have to buy batteries for it. One of the users’ most common complaints is it’s very hard to put the fabric in place, and you might need someone to help you. Works well on thin fabrics. A little bit more advanced version of the Stitch Sew Quick, it features dual speed control, double thread feed and automatic winding function. It’s also a bit more robust, which should account for better durability. Don’t worry about running out of batteries, since it has a port for power adapter – though it doesn’t come included in the package, so you’ll have to acquire it separately. Nice additional features such as speed control and automatic winding make it a good value for the money. 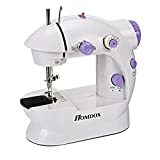 Over 1,700 people have tried and reviewed this machine as of this writing, and it has an average of 3 out of 5 stars on Amazon – a very good rating considering the overall bad experience users tend to have with handheld sewing machines. It wouldn’t be fair to expect a Superman at this price, but in my opinion, it does a pretty good job compared to its competitors within this price range. It features 2 speeds, two-thread lockstitch, top drop-in bobbin for easy threading. Either use a hand switch or a foot pedal to start sewing, and choose from adapter or batteries for power supply. The foot pedal is a rare feature in handheld machines – even though it doesn’t control the speed, you can use it to switch on/off hands-free. Top drop-in bobbin is easy to load and winds automatically. The machine handles different fabrics (even thicker ones like denim) pretty easily. 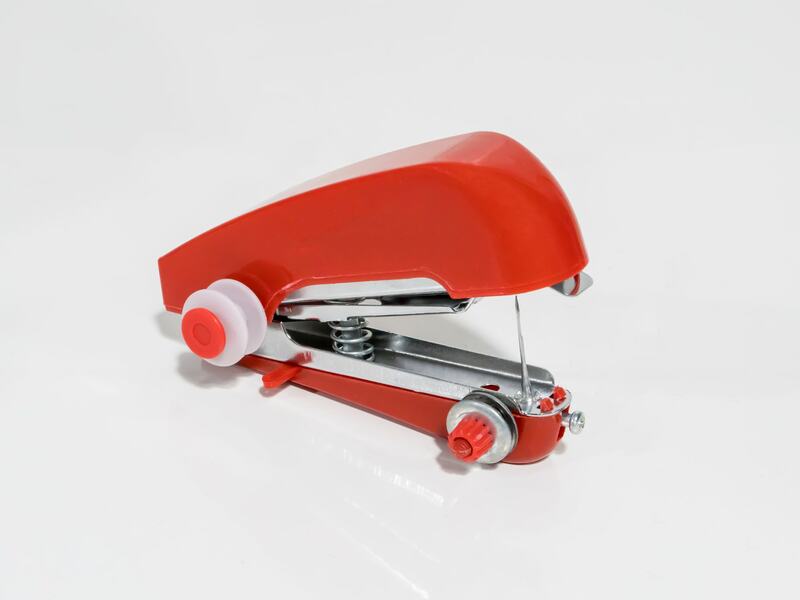 Material: Plastic shell,Mini 2-speed sewing machine offers double thread and perfect stitch control. suit for : sewing freshman ,portable and basic , with easy-to-use features.With portable sewing machine you can sew with ease all kinds of fabrics like silk, denim. Perfect for so many home sewing projects,(US Plug). 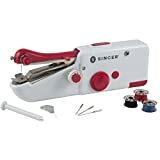 Excellent handheld sewing machine even works on arts and crafts projects.Get rid of big old machine and do stitches fine, quickly and exquisitely.Perfect replacement for your bulky old machine. Comes with thread loop for your convenience. Another machine with dual speed control and double thread, it’s advertised for sewing both light and thicker materials – it will handle silk as well as denim, thanks to the walking foot. Choose from either an adapter or batteries for power supply. Apart from being good for repairs, hemming and mending, it can also do some basic arts and crafts projects. 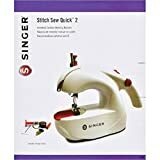 It should suit you whether you want to avoid buying a standard sewing machine due to its price or learning curve, or if you want a handy tool for quick tasks so you don’t have to turn on your full-sized sewing machine. It’s not so small as Singer Stitch Sew Quick, but it will still be convenient for carrying around. Offers both forward and reverse sewing for reinforcing your stitches. Walking foot makes it suitable for thicker fabrics. Users report that it tends to jam and break fast.